Marco Island and southwest Florida are areas rich in history. 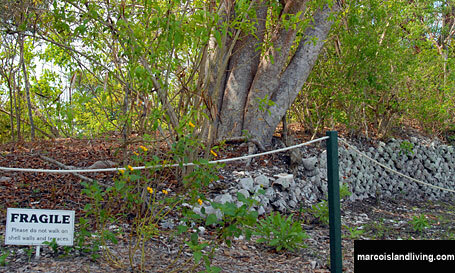 The island’s earliest inhabitants built mounds and retaining walls from shell and Otter Mound displays such work.In March of 2007 the opening of Otter Mound Park on Marco Island took place. The site’s opening ceremony was sponsored by Conservation Collier and co-sponsored by both Southwest Florida Archaeology Society and the Florida Public Archaeology Network.County invasion exotic plant contractors began working at the Otter Mound Preserve in June of 2005. 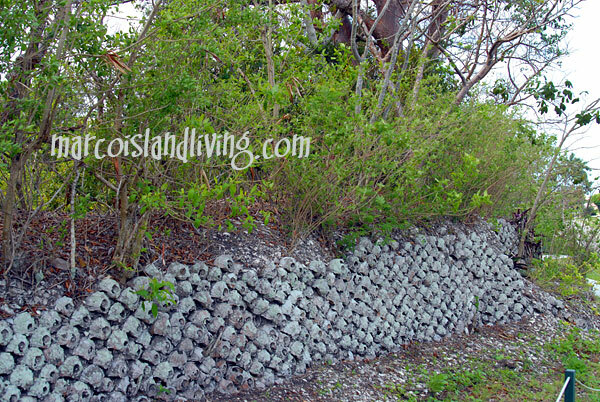 They treated invasive Brazilian pepper, Sansevieria and air potato. A small stand of Sansevieria near the old home site was left on the property for historical significance. Trees formed nearly impenetrable tangled masses over most of the shell terracing. The progress was slow and tedious, but once the growth was trimmed and the Brazilian pepper was removed, the elaborate architecture of Mr. Otter’s creation was uncovered. Beautiful native vegetation also became visible. Large gumbo limbos with their twisted red trunks, mastics, strangler figs, soap berries, yellow elders, stoppers – these tropical hardwood hammock natives now enjoy the south Florida sun.Use care not to disturb the shells or vegetation when visiting Otter Mound. No pets are allowed. Share your Marco Island – Naples FL reviews or ask us about visiting Marco Island Florida. To feature your business, contact us. Save on your Marco Island stay by visiting the official Hilton Marco Island, use Hilton rewards program and explore the latest offerings, special rates and amenities at this resort. Located directly on the beach, minutes from attractions, watersports, Marco Island - Naples activities and world-class golf.